Classic Tel-Time Chrome Talking Watch with White Dial-Chrome Bracelet Band. • Elegant Analog Talking Watch. • Talking Time & Alarm Announcement. 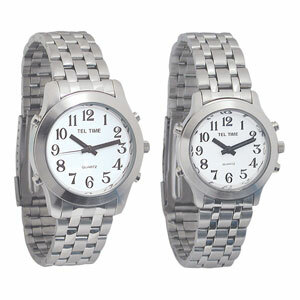 Classic Quartz Analog Talking Watch that has time and alarm annoucement with clear male voice. Chrome Case w/ White dial & 1-12 Black Number-Chrome Bracelet Band. Large, easy to see numbers. Batteries included. 1. Men's Watch - Dial Size: 1 3/8". 2. Ladies Watch - Dial Size: 1 1/4".